TOM BAKER tells kids Dr Who frightens him so much he can watch it only from behind the settee. Which is doubly funny when you realise Baker is 6ft. 3in tall and would have problems contorting himself to safety. Baker became the space travelling problem-solver van and a half year ago (taking over from the grandfatherly Jon Pertwee) and tonight starts a new series with the fearless doctor being whipped by extra terrestrial energy into the intrigues of Renaissance Italy. Twelve million fans will be mesmerised for 25 minutes. The BBC took an enormous gamble casting such a quick-witted, aggressive personality as Baker in a father-figure role. He looked terrifying rather than comforting in The Golden Voyage of Sinbad, the children's film which brought him to the attention of the Dr Who production team. Baker an inspired choice. He has turned the character into a cult figure, replete with fan clubs and Dr Who societies all over Britain. It is rumoured that a university administrator recently broke un a student demonstration by announcing that Dr Who was on the television. By the time they realised it was only Tuesday it was too late. Away from his floppy hat and 17ft scarf. Baker doesn't seem far different from the character he portrays. He doesn't have his screwdriver to get him out of trouble, but his ready wit and outspoken manner do well enough. At lunch in the BBC canteen he waves his arms, shouts across the table to make a point, and only barely restrains himself from leaping down your throat if you say something he disagrees with. His eyes widen until a pair of bright blue irises stare at you from a totally white frame Then he announce: "I adore people who agree with me entirely." "My mother was very religious and until I was 22 I was totally preoccupied with religion." But he is reluctant to talk about his six years in the monastery. "Must we go back to the past." He prefers people to know only the barest details about his private life. That he was once married and has two children who live with their mother came to light only by accident. It was a long time ago — 15 years — and the children are practically grown up. The marriage was a rather sad failure, and I don't like to recall it. APA 6th ed. : Mills, Nancy (1976-09-04). The man Who is. The Guardian p. 7. MLA 7th ed. : Mills, Nancy. 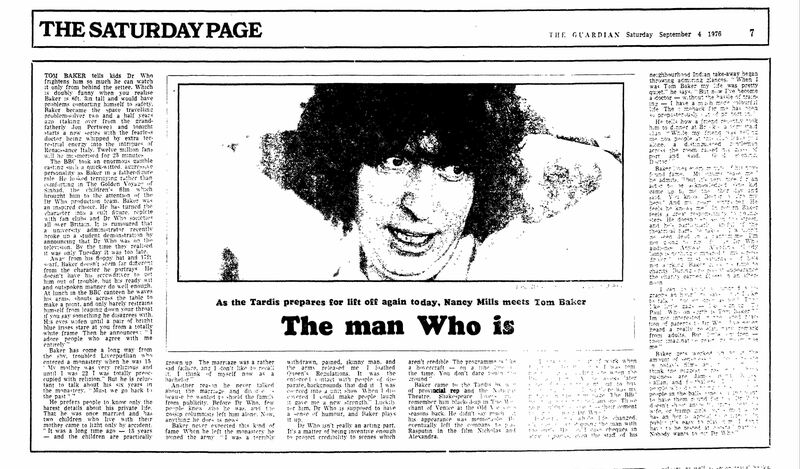 "The man Who is." The Guardian [add city] 1976-09-04, 7. Print. Turabian: Mills, Nancy. "The man Who is." The Guardian, 1976-09-04, section, 7 edition. This page was last modified on 25 December 2014, at 00:06.